Centers through Walk in Interview. 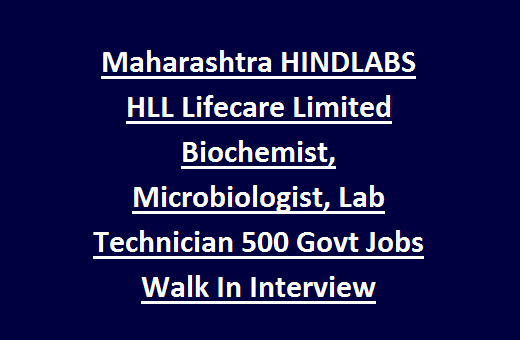 There are total 500 laboratory Personnel vacancies available in HLL Lifecare Limited Recruitment. Candidates having eligibility criteria can attend walk in interview from 14th to 19th February 2017.Candidates selection for the current HLL Laboratory Personnel Jobs recruitment will be based on skill test and written test. For Age, Qualifications details, selection process, Available vacancies, Interview date and other details of HLL Lifecare Limited Laboratory personnel recruitment exam 2017 are given below. Click here to see the official notification of HLL Lifecare Ltd Recruitment. HLL Walk in interview dates: 14th to 19th February 2017 (10 AM to 12 PM). See the official notification for pay scale details. Biochemist: Candidate must have qualified MSC in medical Biochemistry with minimum 05 years experience in Medical Laboratory. Microbiologist: Candidate must have qualified MSC in medical Microbiology with minimum 05 years experience in Medical Laboratory. Senior Lab Technician: Must have qualified MSC / BSC/ Diploma in Medical Lab Technician MLT with minimum 05/ 07/ 08 years of post qualification experience in Clinical Laboratory. Lab Technician: Must have completed Diploma/ BSC in MLT with minimum 04/ 03 years of post qualification experience in relevant field. Candidates with the above qualifications or its equivalent qualification and less experience can walk in for Interview. Upper Age limit of the candidate should be 37 years as on 01 February 2017. Age relaxations will be applicable as per Government rules. Selection for this HLL Laboratory Personnel Jobs will be based on merit in Qualification, Experience and marks in written test. Interested candidates may walk in for Interview between 10 AM & 12 PM on 14, 15, 16, 17, 18, 19th February 2017. Interview will be conducted in 2 stages. Candidates who have qualified in skill test are required to appear for written test. Written Test will be conducted for 50 marks in 30 minutes duration. Walk in Interview dates: 14, 15, 16, 17, 18, 19th February 2017 (10 Am to 12 PM). Candidates are required to bring original certificates/ marks sheets for verification. See the official notification for Date and Place of the interview. 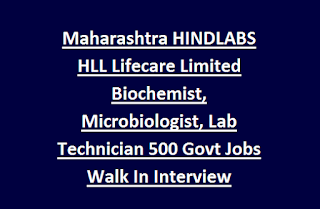 Interested candidates having relevant qualification and experience are eligible to attend walk in interview for HLL Lifecare Limited Laboratory Personnel recruitment vacancies. Candidates are required to bring latest passport size photo, relevant qualification and experience certificates at the time of interview. Walk in Interview dates from 14th to 19th February 2017 at concerned venue given in official notification.